Oral presentations in courses are typically graded on both content and delivery. These elements retain their importance when presenting in front of others during your career, as well. The beginning of the oral presentation is key because it is your introduction of yourself to your audience. 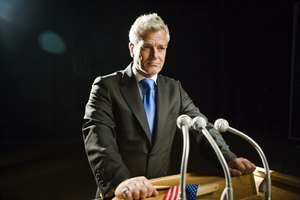 Whatever you say in those first few seconds may set the tone for the rest of the presentation. 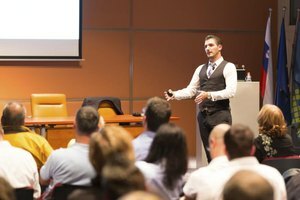 An effective introduction draws the audience's attention and sets the proper tone for your presentation. Before you begin, take a few deep breaths to flood your brain with oxygen and engage in some positive self-talk by reminding yourself that you are prepared and confident that your presentation will go well. Visualize your success and believe in yourself. Deep breathing, positive talk and visualizing success before you begin your presentation can help steady your nerves and improve your performance. Look at your audience. Don't look down at your notes except when necessary, or at your hands or feet. As you begin your oral presentation, seek out two or three people at different places in the room, and look them in the eye. Find a focal point in the room to help you recenter yourself in case you get nervous. Hold your head high and smile. Even if your presentation isn't on a particularly happy or funny topic, it can't hurt to smile at your audience before you begin your oral presentation. Body language is a powerful method of communication so make sure to maintain good posture throughout your presentation. Stand up straight, keep your head held high and try not to fidget. Begin your oral presentation with a comment, quote, or fact that will stick with your audience long after your speech is finished. The key is to find something that portrays the essence of your topic in a profound way. It may even sum up your entire topic before the audience even knows what your presentation is about. This they will recognize, of course, by the end of the presentation. Speak clearly and in a practiced tone and volume. There is nothing worse for a public speaker than to open his mouth and find that his voice has become gravelly or, even worse, high-pitched. Vary your tone of voice to avoid being monotone. Keep a glass or bottle of drinking water handy on the podium if it is allowed, and sip it frequently in the seconds prior to speaking. Know your speech inside out and well ahead of time. Practice makes perfect, and nothing is more perfect in an oral presentation than the lack of need to constantly refer to your notes. By all means, keep notes at hand on 3-by-5 inch cards, but refer to them only when absolutely necessary. Deliver your speech in front of a mirror a couple of times so that you can see what your audience will see. Practice in front of trusted friends and family, too, and ask for their feedback on your performance. Ripley, Kimberly. "How to Start an Oral Presentation." Synonym, https://classroom.synonym.com/start-oral-presentation-4060.html. 25 June 2018.